Friske Orchards Farm Market, located near Charlevoix, is a three-generation family farm, established in 1962. Friske’s has an indoor fruit stand in a temperature-controlled area. In May they are harvesting asparagus, strawberries in June, cherries and raspberries in July, peaches in August and pears and apples in the fall. 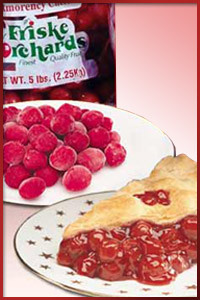 They sell cherry products, as well as their own jams and jellies, salsa, honey, maple syrup and more. In addition, they offer an assortment of fresh vegetables. Friske Orchards has a bakery and pastry shop as well as The Orchard Cafe, The Country Haus and The General Store. Directions: Located 10 miles south of Charlevoix on US-31 in Atwood.